We woke at 5.30am and peered outside at the snow-covered ground, on Beijing’s second day of snow for the winter. Down at the hotel lobby, with no taxis in sight, we tried to explain that we had booked a taxi the night before however our plea for assistance was met with deaf ears as we were told “it’s too early for taxis” and “that’s your problem”. Although we had left plenty of time to get to the station we both started to panic a little after waiting around for 15 minutes. The porter went out onto the road in the snow trying to hail a taxi but gave up quickly and told us to wait inside. While Richard went back to the desk to see if we had any other options, I went out to the road in a last-ditch attempt to find a car. Luckily at that moment two taxis passed by and I hailed one of them, much to the surprise of the porter and another couple who seemed amused by our situation. Down at the train station the snow seemed to be causing more mayhem as crowds gathered trying to get inside. We quickly located our platform and waited in the queue to have our tickets checked. In the line we met a fellow Aussie who is doing a similar trip to us. We said goodbye once we approached our carriage, assuming we would meet later on in the dining car. 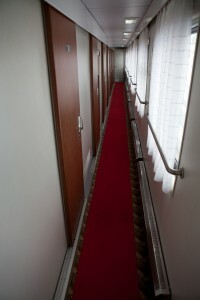 For half of the trip we have chosen two-berth cabins and for the other half, four-berth cabins. To our delight, the entire train carriage is well above the standard we were expecting, particularly after our overnighters on Indian trains (which, I should add, were nothing to complain about). Our cabin has two bunk beds, a shared bathroom with the cabin next door, a small table, an arm chair, two televisions (which are currently screening Mongolian-dubbed Hollywood movies) and some limited storage space. It’s pretty comfortable! We had read about getting on-side with the carriage attendants (the provodnitsa), so were cautious to be as polite as possible when talking to her. She was just as responsive and minutes later brought us our bed sheets and asked if we’d like a cup of coffee. 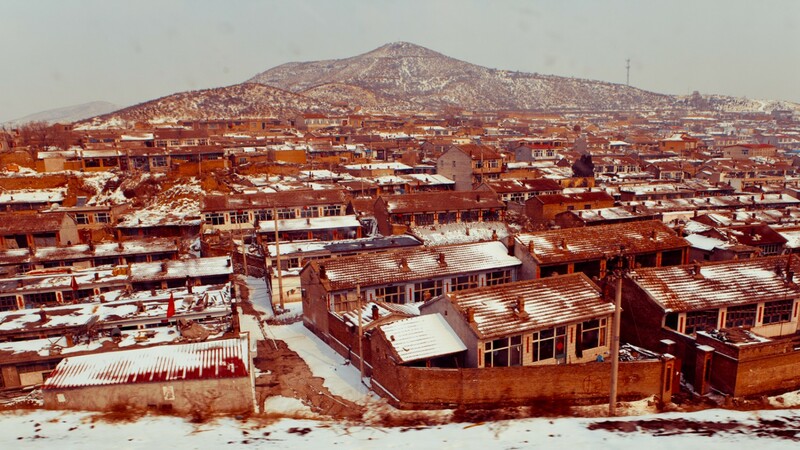 We settled in with our drinks and watched the landscape change from the urban outskirts of Beijing to rocky mountains with sheer stone wall faces and then to open plains. We passed through several mountain tunnels, the longest of which left the outside in darkness for about three minutes. Our first stop was at Zhangjiakou, 193 kilometres from Beijing. We stepped off the carriage to get some air only to find about 500 faces staring at us from another platform. It was much colder outside than Beijing and our first taste of the sub-zero temperatures to come. As the train started to jolt forward we hurriedly stepped back inside the carriage, where you would have no idea of the outside temperature if it weren’t for the snow-covered ground. For all the anticipation, our first 24 hours on the train passed by pretty quickly. After lunch, Richard took a nap while I settled into the comfy arm chair and read my book, watching the Gobi Desert roll by outside the window. Around mid-afternoon a Mongolian man asked us to have a drink with him in his cabin. We accepted and were surprised to find another guy sleeping in on the bottom bunk, seemingly unaware of our presence. We spoke in broken Mongolian and English, with the help of our limited set of phrases, but after a beer and a couple of rice wines (it’s offensive to decline, really!) we ditched the book and just started acting out what we were trying to say without words in what felt like a drunken version of a high school drama class. The Mongolian guy got pretty into it, enough to wake his companion from his sleep. Not wanting to get on the bad side of the carriage attendants, we decided at this point it was probably time to head back to our own cabin. Around dinner time we met up with our Australian friend and a French man who both by chance had secured four-berth cabins to themselves. The train is not very busy, particularly considering it’s the low season, but we weren’t expecting it to be that quiet. The food in the dining car was pretty good – typical Chinese food with rice, and of course a cold beer. After spending seven weeks in a country where alcohol just isn’t part of the national psyche, we’re both struggling a little to keep up! At around 8pm we were hurried along by the dining car attendants who informed us that within 15 minutes we’d be reaching the Chinese-Mongolian border at Erlian and needed to be in our cabins for the Chinese customs check. Back in our cabin, the border officials came to collect our passports. Although we were both a little uncomfortable with our passports being out of sight for three hours or so, the whole process seemed pretty straightforward. The train then proceeded to the next stop – a large warehouse with a team of engineers equipped to change the bogies from the standard size to the Russian/Mongolian size. This was an interesting but time-consuming process (all up around another three hours) during which each carriage had to be detached and hoisted up, ready for the bogies to be changed. Thankfully we were allowed to stay in our cabin watching the process unfold, as hours in the dark and sub-zero temperature didn’t really appeal. By around 12.30am we made it across no-man’s-land to the Mongolian side of the border where we had to have another customs check. The officials, mostly women, were friendly so there was nothing intimidating about this at all. Again our passports were collected and returned by 1.30am, at which time the train was free to pass and we were finally free to get a few hours of sleep. I am really inspired with your writing talents as well as with the layout to your weblog. Is that this a paid theme or did you modify it your self? Anyway stay up the excellent high quality writing, it is uncommon to look a nice weblog like this one nowadays..
Glad to hear you enjoyed the post Patty, I can highly recommend spending a few days in the Gorkhi-Terelj National Park (an hour or so outside of UB). It is a great place for hiking and you can also go visit the locals to see how they live. I am sure you will have a very different experience than me as it was -27C when I was there! I enjoyed reading your blog and am hoping to read more when I have more time. My husband, 12 and 17 year-old daughters and I are planning to take the train from Ulaanbaatar TO Beijing in August, so this was nice to know what to expect. We are planning to visit Mongolia for about 10 days. If you have any suggestions, please let me know!